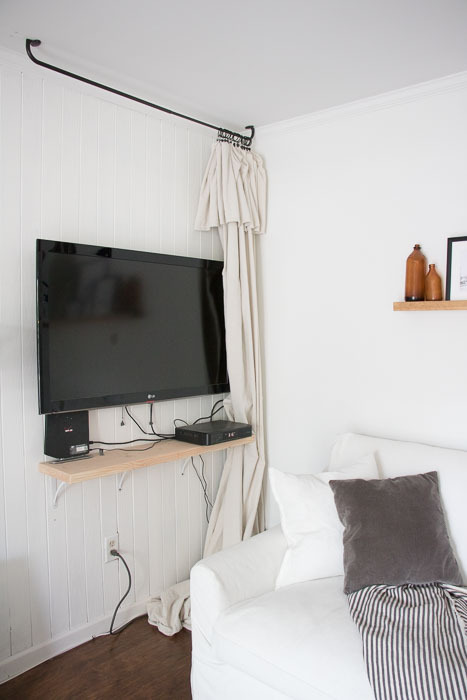 How to hide a TV with a drop cloth curtain. Well, you guys my family room which got quite the cottage style makeover, certainly has come a long way. I think probably the best decision I made not only was to add the beautiful Farlov sectional to our space, but to also remove our TV from our mantel. I always felt I could not decorate the room to it’s fullest potential and now that I’ve taken the TV down it certainly feels more cozier then ever. The problem was trying to find a new home for the TV. We had to keep a TV in the space since it is more of the hang out room in the house, but with the lack of wall space and no longer having the mantel to keep the TV on, I decided to just mount it on the only blank wall there is. That lead to a problem of course though…where do we put our cable box, and how to do we hide the TV? Did I mention I needed to stay on a tight budget? 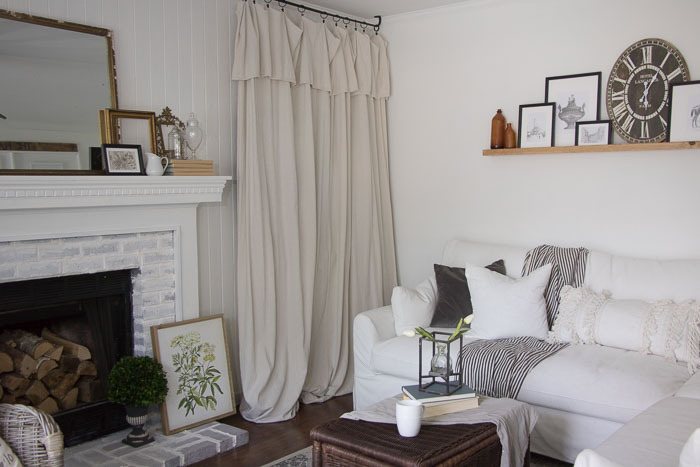 Yep you guessed it, I hid our TV behind a DIY drop cloth curtain! I mean it’s easy, affordable, and really cute too! When we’re not watching TV we just keep the curtain closed, and when we are it really doesn’t matter how the TV and cables look. It was the perfect solution! 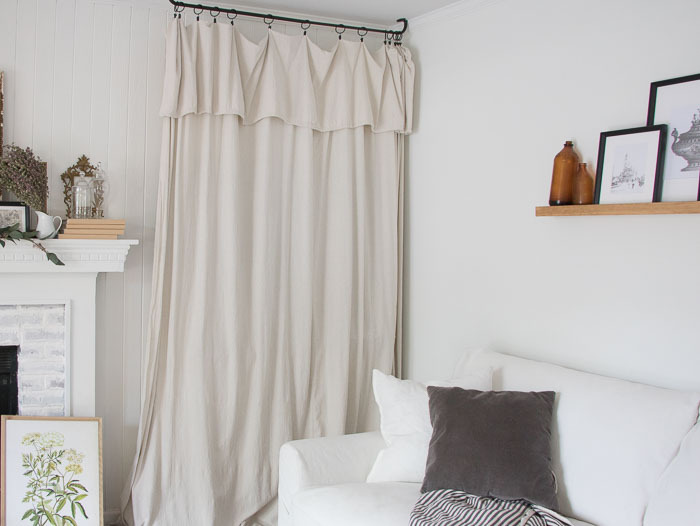 Now you can always create a hem for your drop cloth as I had done in my DIY Drop Cloth Curtains for my dining room, or you can just use the curtain rings to create an easy curtain as well. Since I was going more cottage style in here, I thought the little tiered curtain would be cute so I chose some curtain rings for this. this post contains affiliate links that I make a small commission from, with no added cost to your purchase. 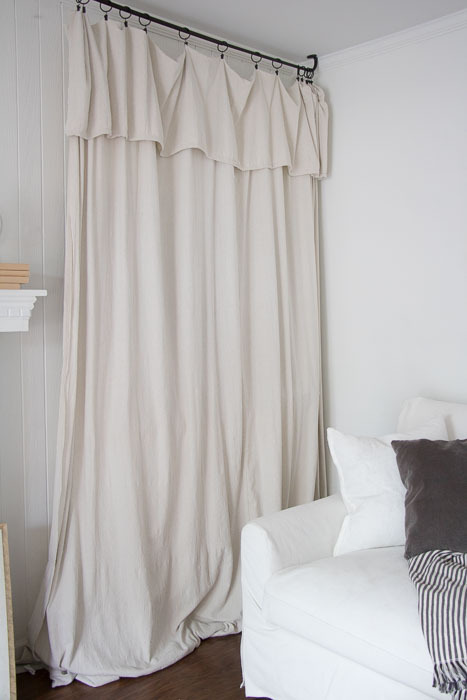 Just screw the curtain Rod into ceiling, add curtain rings to your drop cloth, and hang! Oh and you can try bleaching your drop cloth too. I tried mine, long story, but it did come out softer. You can read this tutorial here, from my friend Cami’s blog! okay so, it’s a little sloppy without the curtain, but I plan to eventually tack the wires to the wall to make it a bit neater…but you can never tell when the curtains are shut! I prefer to use a pretty piece of furniture like an armoire for the tv. I don t think tv s are attractive and don t understand why anyone would want them mounted on their walls. right? 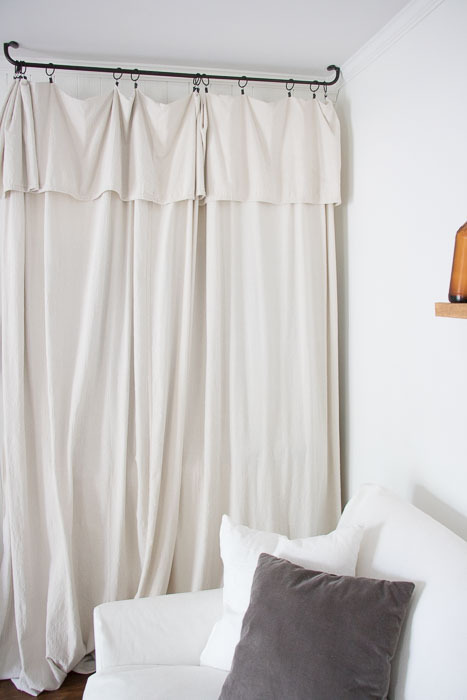 that’s why we mounted ours and covered it with this curtain. It works best that way. If it were up to me, I would only have one TV in my house. What a great solution for families that move often, like military families. Congrats, you’re featured at the This Is How We Roll Link Party on Organized 31. Hi Susan, thanks so much!!! That’s a good point, never thought about that option.